Do you love Thai food? Do you think peanut sauce is its own food group? Then this recipe is for you! As an added bonus it also goes together pretty quick and if you make extra of the marinated chicken, you can make satay skewers or chicken for wraps for a later meal. I will give you that the ingredients list is a little long, but after you make this recipe once you’ll have the hang of it and it will go together in a flash. I probably could eat this every day of my life. Seriously, if I was stranded on a desert island, I’d want this to come with me. It’s amazing. 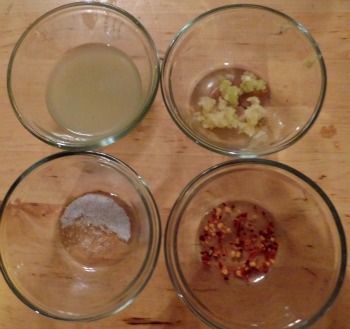 Mix dressing ingredients in a bowl until smooth. Prepare noodles according to packet instructions. Place both cabbages and carrots in a bowl, add ¼ tsp salt, toss to combine and set aside for 5-10 minutes to wilt lightly. Place the Satay Chicken ingredients EXCEPT the oil in a bowl and toss to coat. Heat oil in a non stick fry pan over high heat. Add the chicken and cook for 3 minutes until golden, then transfer to a plate. 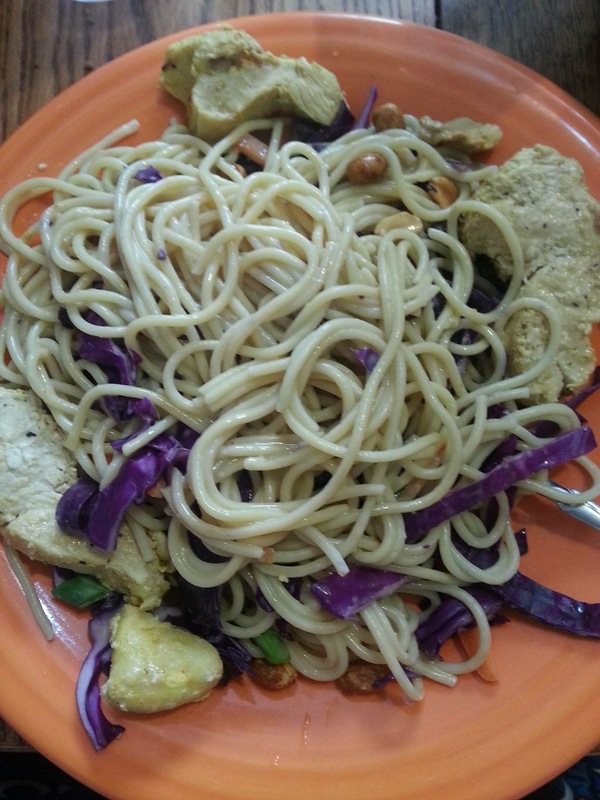 Toss noodles and remaining salad ingredients with chicken and Dressing, then serve. Serve at room temperature or warm. Honestly, my kids LOVED this. They are 4 and 2 and while the 4-year-old is kind of hot and cold on cabbage, the 2-year-old reliably loves it. They both will happily devour pretty much anything pasta. And pasta with peanut sauce, forget about it! They go nuts! Also, fun fact if you let your kids help in the kitchen, they are more likely to eat what you make! I am not one for making separate meals for everyone, so we all eat the same thing. This recipe is a great one to let the kids help with because they can safely measure out all the peanut sauce ingredients and whisk them up. I also let the kids assemble the ingredients and pour on the dressing. They really love helping! I hope you enjoy it as much as we do! My family all love Italian food and around here if we take a break from Italian food it is for Mexican food, so what that means is we use a lot of ground beef. I was overjoyed to do a review and recipe with Jones creek Beef, they have fabulous ground beef, so when I got it the first thing I did was make meatballs and freeze them. This is one of the best shortcuts I think I can give anyone who loves to cook Italian. One of my son’s favorite dishes I make is Meatball Sub Casserole. (Full recipe below) I cut up some biscuits, add my meatballs, marinara sauce and cheese and bake until bubbly and delicious. I have made this recipe a lot but, I have to say that when I made it with Jones Creek Beef it was beyond fabulous! Jones creek Beef is all-natural, grass-fed beef, this beef is premium free range, grass-fed, and grass finished beef which means it is never fed grain, cattle that is feed and treated right from the beginning to end is always going to be a better product. 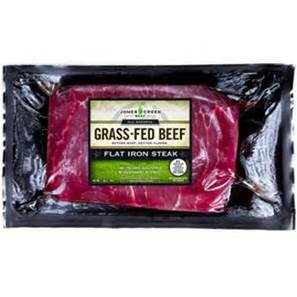 It is more important to buy grass-fed beef than it is to buy organic beef, as organic only ensures that it is not fed anything treated with pesticides, but even with the best organic grain, if it is not grass-fed it is going to have a higher level of acidity and this makes beef have a higher chance of having e.coli thrive in it. Who wants that in their beef that they are feeding their family. I don’t want any e.coli around my family even if it is organic! I am so impressed with the fact that Jones creek Beef is not just grass-fed while at pasture, it is grass finished which means it is never fed grain in its entire life. They do it right, throughout the process. This beef is flavorful, lean, and better for you. I know that it is suggested to eat white meat more often but, in all honesty it just does not happen around here, we are beef lovers, we use ground beef, roasts, steaks, tips, all of it, very seldom do we have chicken or fish maybe twice a month, and this beef from Jones Creek is far superior to anything we have eaten, and we eat grass-fed beef 90 percent of the time. If you are a beef eating family, this is the best of the best! You are going to love the way this beef tastes and how much better it is for you. 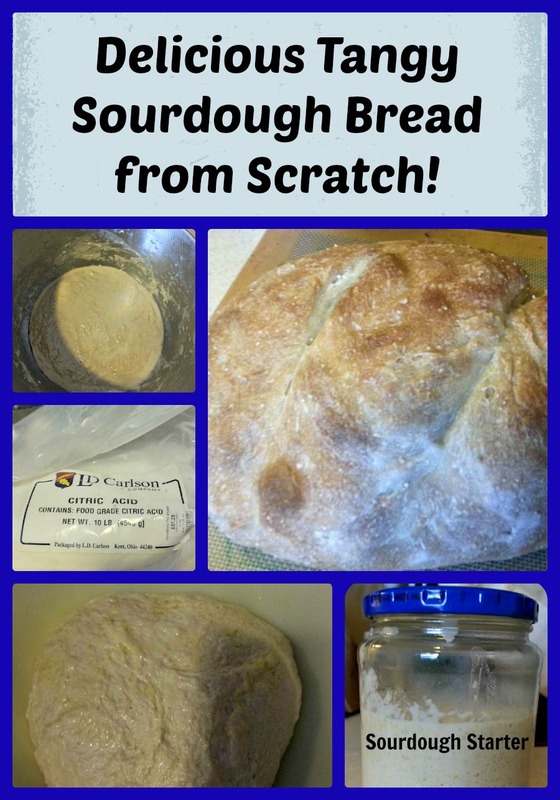 Every recipe you use this in you will be surprised by the difference in the taste and textures. You can learn more about Jones Creek Beef at their website or on Jones Creek Beef,Pinterest, and Pinterest. Mix together and make into meatballs, then bake in the oven until brown and to 165 degrees. Cool and freeze for later use or use right away in any recipe. Spread the cut up biscuits on the bottom of a well-greased casserole pan, add meatball to the top of those and spread evenly, pour the sauce over the meat and biscuits sprinkle with half of the mozzarella cheese spread grated Parmesan cheese over and then cover with the slices of provolone. Bake at 350 degrees for 25-35 minutes. It will be bubbly and HOT! Serve with Fresh fruit and salad. 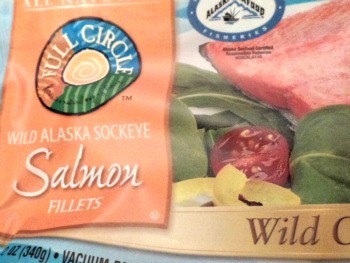 Alaska Salmon Frozen to Fork Fast Dinner! Every day my husband and my kids ask me the same question and I am sure you get the same question as well. It is that wonderful, “What’s for dinner?”. I really don’t hate the question as much as I hate trying to remember to take something out of the freezer and have it thawed and ready to cook for that night. I cannot tell you how many times I used to go grab take out, or make a box of mac and cheese with fish sticks simply because I forgot to take something out for dinner. I have found a solution to this problem for at least a couple of times a week. 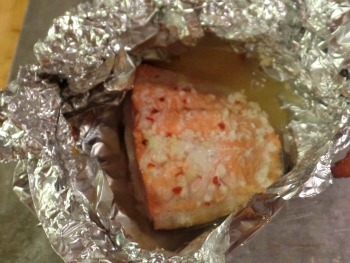 I can cook Alaska Salmon frozen with my Citrus Garlic Foil Salmon and it can go from my freezer to the dinner table in about 30 minutes. I have one of the kids help with a salad, make up some brown rice and not only do we have a healthy dinner but a fast one on the days where I simply forget to take something out of the freezer. 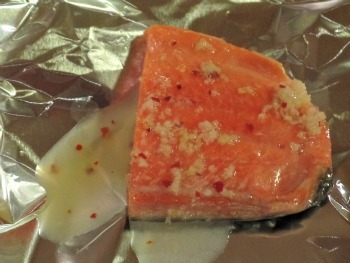 Some of the things that I love about Alaska Salmon and using it frozen are that it is all wild caught in the ice-cold waters of Alaska, and right after it is caught they chill the catch and flash freeze it, which ensures that the Alaska seafood is kept as fresh as possible locking in the fresh flavor and best quality. The cold environment of Alaska allows for seafood that’s lean, firm and superior in flavor. It is full of great quality protein and has vitamins, minerals and of course oils that are essential to good health. There are five species of salmon, several varieties of whitefish and quite a few shellfish species, Alaska can provide your best seafood options year round. You can cook all of these varieties from frozen and be assured of a healthy and tasty meal no matter what your schedule looks like. They even have a great recipe resource and cooking guide at AlaskaSeafood. So, let’s get on to my recipe and helping you make a weeknight meal for when that question comes to you! While you are waiting for your oven to heat, rinse the fish with COLD water and pat dry, do not skip this step, it takes off the water which will water down your spices and make your fish bland. While your fish is baking, make your side dishes and dinner is served! 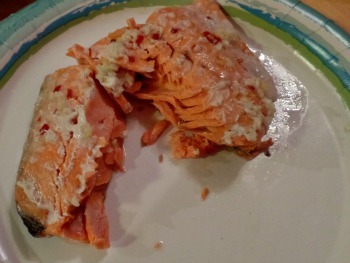 I hope you will try this, it is one of my favorites, its low in calories, easy, fast and Alaska Salmon is high in protein, low in saturated fat, low in sodium and one of the best sources of heart-healthy omega-3 fatty acids. You can check out one of more than 600 live cooking demonstrations at a store near you, just check out this locator for one close to you.